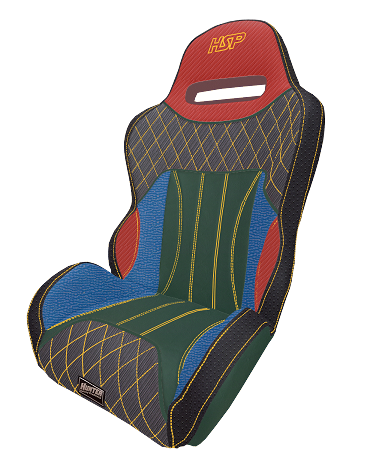 Our RAGE RZR bucket seat was HSP Seats first gen seat we created and was one of our best sellers! The RAGE keeps you contained with just the perfect amount of lower/upper bolsters. The RAGE seat is a true suspension seat using the best liner and parachute cord possible. We build ALL our seats with the highest grade high density foam for the ultimate comfort! Once you sit in one you will notice a difference in ours vs the competitors in a hurry! After a long day of serious riding your body will thank you for such a comfortable seat! Please be aware colors listed/displayed on the online designer are not an exact match and may vary from screen to screen. If you are looking for an EXACT match or to request samples please contact us.